Now is not a good time for sedan sales as crossover madness pervades the market. Even the excellent 2018 Honda Accord is having trouble finding customers. But the segments’ losses could be your gain. The new 2018 Mazda6 is here with a punchy turbocharged engine, and it looks to be a killer value. The car you really want is the Mazda6 Grand Touring, which finally has a motor to match its “GT” moniker with the SKYACTIV-G 2.5-liter turbo engine. The Grand Touring model has an MSRP of $30,090 which is cheaper than the Accord Sport 2.0T with an automatic at $31,200, but the Mazda’s equipment set actually aligns more closely with the Accord EX-L 2.0T that stickers for $32,860. While an automatic is the only available transmission, Mazda says the six-speed automatic was developed specifically for high-torque applications. The motor also regulates the boost to be more progressive as the car accelerates to minimize torque steer. The Grand Touring trim will build on the Touring model and will include upgrades such as Navigation and a BOSE stereo. Mazda now even has two additional trims above the Grand Touring, with the Grand Touring Reserve at $32,590 and Mazda6 Signature at $35,640. Below that, the naturally aspirated 2.5-liter motor will still be available as well. Pricing for that starts at $22,440. 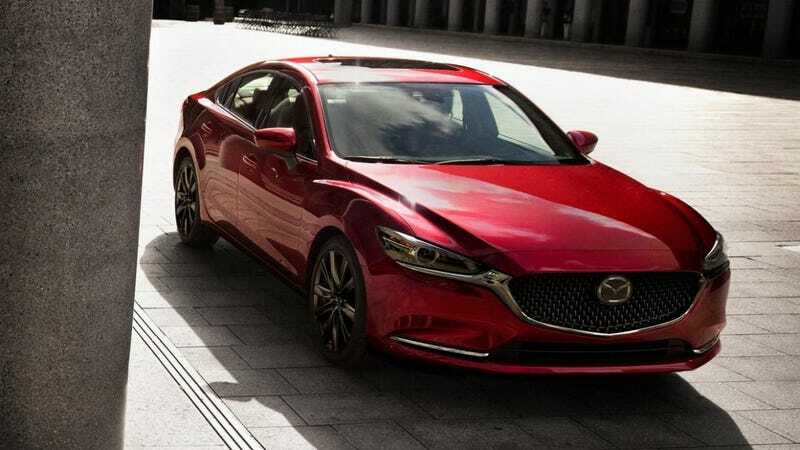 The Mazda6 is one of the few family sedans that is not abysmally boring to drive, and while others like the Accord and Camry have finally caught up to it from a dynamics perspective, Mazda is not about to hand over the crown just yet. While Mazda’s release did not mention anything about the potential for an all-wheel drive model, we’ve heard that’s coming, so maybe Subaru is on notice here as well as Honda.